Prime Minister Justin Trudeau and U.S. President Donald Trump found common ground on boosting the economy, securing the border and empowering female business leaders. But the two leaders are at odds over immigration policies. Prime Minister Justin Trudeau and U.S. President Donald Trump found common ground on key issues such as boosting commerce and military co-operation, but the two leaders staked out very different stands on immigration policy. During a joint news conference following the pair's debut meeting, Trudeau carved out Canada's position as open and welcoming to refugees and immigrants without compromising security, while Trump defended his own hardline approach to close the door. Asked whether he believes the northern border of the U.S. is secure, Trump said, "You can never be totally confident." The U.S. president has been facing legal battles and protests over executive orders to suspend the intake of refugees and impose a travel ban for seven Muslim-majority countries. But he said today he is only following through on his promise for ridding the country of criminals and drug lords. "We are getting such praise for our stance. It is a stance of common sense. Maybe a certain toughness, but really more than toughness, it's a stance of common sense," he said. "We are going to pursue it vigorously, and we don't want to have our country have the kinds of problems that you're witnessing taking place not only here, but around the world." Trudeau said Canadians and Americans have a long history of working, fighting and dying together, but there are times when they take a different approach. "The last thing Canadians expect is for me to come down and lecture another country on how they choose to govern themselves," he said. "My role, our responsibility, is to continue to govern in such a way that reflects Canadians' approach and be a positive example in the world." On the North American Free Trade Agreement, Trump appeared to assure Canada that his primary concerns with the deal relate to Mexico. He praised the Canada-U.S. trade relationship as "very outstanding." "We'll be tweaking it. We'll be doing certain things that are going to benefit both of our countries. It's a much less severe situation than what's taken place on the southern border, on the southern border for many, many years the transaction was not fair to the United States," he said. Trudeau stressed that jobs and business on both sides of the border depend on trade and an integrated economy. "We know that by working together, by ensuring the continued effective integration of our two economies we are going to be creating greater opportunities for middle-class Canadians and Americans now and well into the future," he said. The news conference followed a joint statement issued mid-afternoon, in which the two leaders recognized "profound shared economic interests" and pledged to work to boost growth and generate jobs in both countries. The statement says the two countries will work to expedite the Gordie Howe International Bridge between Windsor and Detroit, move forward on the Keystone XL pipeline and commit to establishing pre-clearance operations for cargo crossing the border. "We intend to accelerate the completion of pre-clearance for additional cities and continue to expand this program," it reads. The statement also expresses a shared "strong concern" about opioid-related deaths, pledging the countries to work together to stop opioid trafficking. The release says the U.S. also welcomes Canada's plan to hold an open competition on replacing its fleet of CF-18 fighter jets, and to buy a fleet of 18 U.S.-made Super Hornet aircraft in the interim. It also says the U.S. values Canada's military contributions, including efforts to combat ISIS and in Latvia. There was no mention of the softwood lumber dispute or fighting climate change. Earlier in the day, the two leaders announced a joint task force to promote female executives. The Canada-U.S. Council for Advancement of Women Entrepreneurs and Business Leaders, made up of five women from each country, will recommend ways to promote female-owned enterprises and boost economic growth. 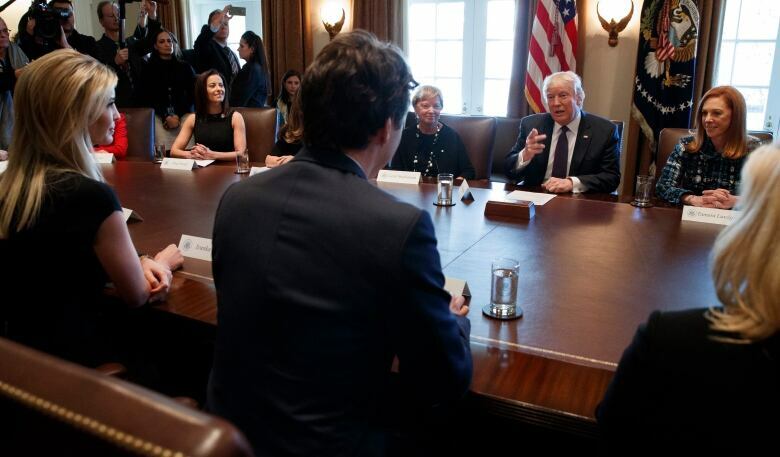 Trump, meeting with the Canadian prime minister in Washington on Monday, said women as executives have played a "tremendously important" role in his businesses, but also that more must be done to enable more women to work and thrive. "We need policies that help keep women in the workforce and to address the unique barriers faced by female entrepreneurs," he said. Trudeau, seated beside Trump's daughter Ivanka Trump, said the council will study the challenges and paths to success for women. He said leveraging powerful women is not only about doing the right thing. Women in leadership roles contribute to the success of businesses, communities and entire economies, he said. Ivanka Trump, a successful entrepreneur who helped organize and recruit participants for the event Monday, said she looked forward to hearing more perspectives about how to "level the playing field for this generation and the next." Early in the day the Prime Minister's Office and the White House released a list of names detailing who sat on the council. Later in the day that list was corrected by the White House and shared by the PMO to reflect the names below. Elyse Allan, president and CEO, GE Canada. Mary T. Barra, CEO, General Motors. Monique Leroux, president of board of directors, Investissement Québec. Tina Lee, CEO, T&T Supermarket Inc. Dawn Farrell, president and CEO, TransAlta Corp.
Deborah Gillis, president and CEO, Catalyst. Tamara Lundgren, president and CEO, Schnitzer Steel Industries Inc.
Julie Sweet, CEO, Accenture, North America. 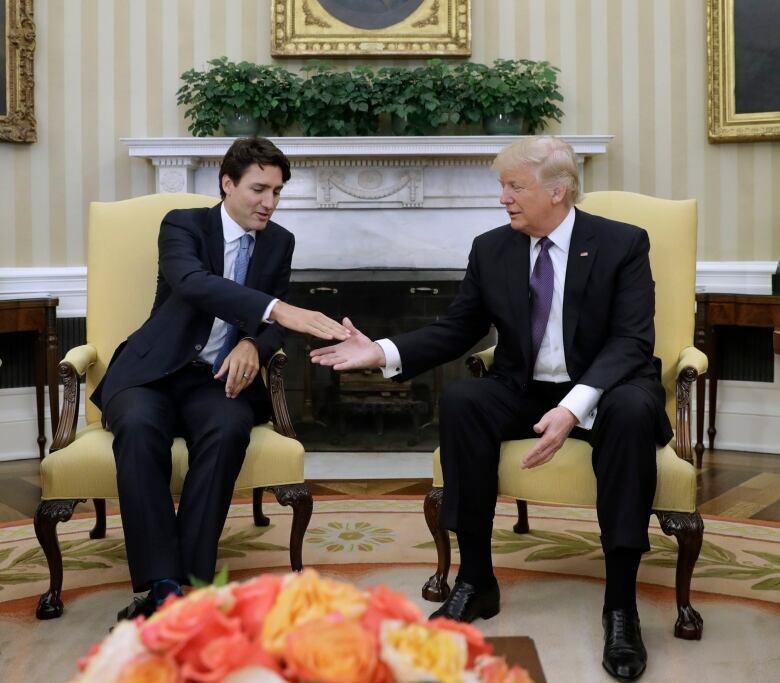 Annette Verschuren, Chair and CEO, NRStor Inc.
Trudeau was greeted with a handshake from Trump at the White House Monday morning. The pair then posed for a photo in the Oval Office, seated in armchairs in front of the fireplace in a near silence, except for the click of cameras. Trudeau's one-day visit to the U.S. capital is viewed as critical for setting the tone for the Canada-U.S. relationship under the new Republican administration. Several key cabinet ministers accompanied Trudeau to Washington: Foreign Affairs Minister Chrystia Freeland, Defence Minister Harjit Sajjan, Public Safety Minister Ralph Goodale, Transport Minister Marc Garneau and Finance Minister Bill Morneau. Andrew Leslie, the parliamentary secretary to the minister of foreign affairs with special responsibilities for the Canada-U.S. relationship, and David MacNaughton, Canada's ambassador to the U.S., are also part of the delegation. The prime minister's wife, Sophie Grégoire Trudeau, did not participate in the trip. Later in the day, Trudeau met with Speaker of the U.S. House of Representatives Paul Ryan and Senate majority leader Mitch McConnell. NDP Leader Tom Mulcair and NDP immigration critic Jenny Kwan wrote to Trudeau, pushing him to raise the issue and ask for a guarantee that people will not face discrimination at the border. Treatment based on heritage or religion is "humiliating, completely unacceptable and harmful to Canada-U.S. relations," the letter reads. "As prime minister of Canada you represent the views and interests of Canadians on the world stage," the letter says. "Canadians are resoundingly opposed to Mr. Trump's travel ban and you are therefore duty-bound to express Canada's opposition to these policies." The 9th U.S. Circuit Court of Appeals has upheld a restraining order on the original travel ban, but Trump said Friday he is considering signing a new executive order. Trump said he expects his administration will win the legal battle over his original directive. A White House official said the administration was not planning to immediately ask the Supreme Court to overturn the restraining order and would argue for its constitutionality in the lower courts. The official say next steps were not yet finalized and could change.